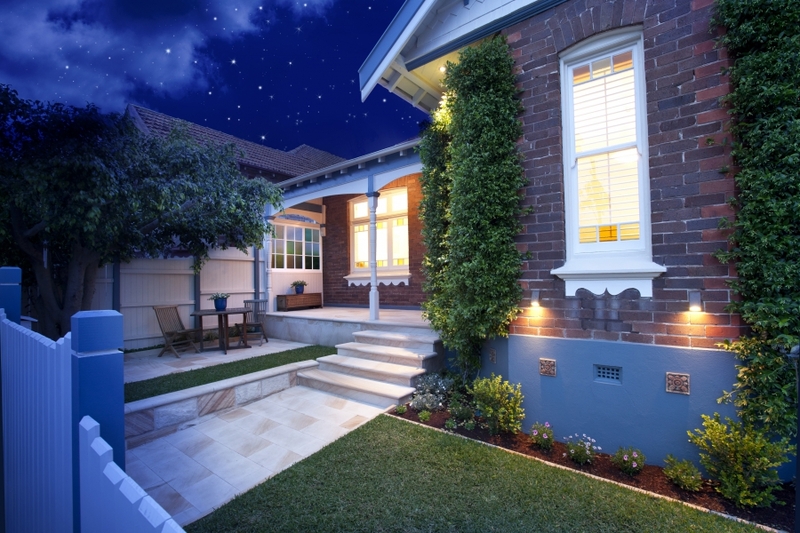 Landscape lighting can add elegance and style to any outdoor space. 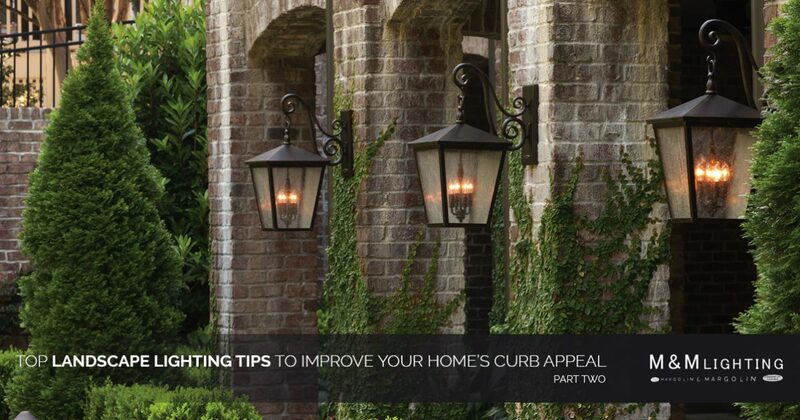 As a Texas homeowner, you may be looking for ways to improve the curb appeal of your yard through the use of outdoor lightings techniques. In part one of this series, we discussed what you should consider lighting in your landscape. In part two, we’ll take a closer look at the different types of landscape lighting options available so you can choose the best lighting design that fits your needs and budget. If you’re looking for landscape lights and other outdoor lighting options for your home or commercial business, be sure to stop by M&M Lighting’s showroom in Houston today. We offer a large and decorative selection of lighting products from some of the best lighting manufacturers available including Kichler, Hadco, and Casablanca. When you visit our lighting showroom, one of our lighting experts will work with you one on one to answer any questions or concerns you may have. Visit us in Houston today for your new landscape lights! Path lights may be the most common type of landscape lighting available. These lights are often mounted on small posts that have a light built in and are capped with a diffuser. These light fixtures can be spread out down a walkway or used to frame a specific space or feature in your yard. Path lights are a great way to illuminate a walkway, pond or driveway. At M&M Lighting in Houston, we offer a diverse and affordable selection of landscape posts and bollards. If you live in Texas, be sure to stop by our lighting showroom to browse all of our landscape lights, accent lights, and more! If you live in a modern home, you may want stylish architectural lights to display in your front or back yard. Postmount lights are designed to install onto a post or on top of a structure. They are most commonly used for entryways, fences, gates, or around a deck. If your Houston home features a deck or steps, you may want to consider illuminating them for safety reasons. This can be especially helpful if you like to throw get-togethers or parties at your home, so your guests don’t trip and fall as they walk up the stairs to your abode. M&M Lighting carries a unique selection of step lights in our Houston lighting showroom and online. You may not realize it, but spotlights are actually the backbone of most landscape lighting systems. These lights can be used for highlighting a number of outdoor features. Whether you’re looking for a way to highlight a certain tree, sculpture or architectural design, spotlights can help you achieve a classy and decorative look. Also known as the heavy duty cousin of path lights, flood lights can be used to illuminate your driveway, walkway or back porch. These lights are normally very durable, making them super resistant to even the most harsh weather conditions. Well lights are a variant of the spotlight, except that they are recessed into the ground to create a seamless look in both landscape and hardscape settings. Many homeowners love these lights because of their sleek, inset profile. Well lights can be used to uplight trees, walls, sculptures and more. At this point, you may feel overwhelmed with the variety of lighting options available for your landscape. That’s why we always recommend working with lighting professionals before you start purchasing lights for your home’s exterior. At M&M Lighting in Houston, all of our lighting experts have successfully completed the certified lighting training from Lightolier and the American Lighting Association. With years of experience in the Houston lighting industry, our lighting professionals are capable of solving all of your lighting problems. Contact us today to learn more about our lighting options! 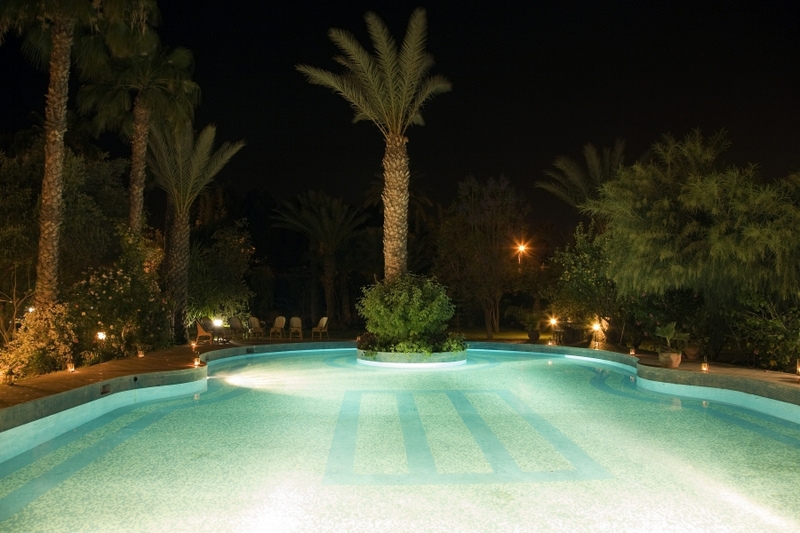 Up-lighting is one of the most basic forms of landscape lighting available. It can be used to create more drama in areas of your yard that don’t get much attention. Whether you want to highlight the underside of a tree’s canopy or a row of decorative bushes, up-lighting can help you achieve the look you’ve always wanted. The best light fixtures for up-lighting are spotlights and well lights. Silhouetting is a wonderful lighting effect that can be used to highlight dramatic shapes and shrubbery that like to hide in plain daylight. To achieve this lighting, place your light source behind the item you wish to feature. Aim the light where you’d like the main vantage point to be, and make sure the light source itself cannot be seen. Spotlights and well lights are the perfect light fixtures to achieve this style of lighting. Also known as the reverse of silhouetting, shadowing is a great way to add depth and character to your home’s landscape. Place the light source between the main vantage point and the item being lit. Make sure the light source is aimed at the tree or fixture you want to highlight. This style of lighting works exceptionally well if you have a wall or another flat surface behind the item being lit to catch the shadows that are being created. Spotlights, floodlights, and well lights can all be used for this style of lighting. Moon lighting is an effective way to highlight your outdoor space if you have large trees and decorative landscaping. When trying to achieve this lighting technique, place the light source high up in a tree and aim it downwards. This creates an impressive effect when used in an open-branched tree, not to mention it will make your landscape look marvelous! Grazing is another great lighting option that can be used if you have a hardscape-heavy yard. To achieve this look, you’ll want to place the light close to the flat surface and aim the light directly up or down. This will create a dramatic lighting effect with some shadow play. This can add an upscale touch to your landscape, and can be found in most hotels and restaurant designs. As you can see, there are many lighting styles that you can incorporate into your landscape to improve your home’s curb appeal. If you live in Texas and you’re looking for new light fixtures to highlight trees, bushes, sculptures, walkways, ponds, flowers, and more, be sure to visit M&M Lighting’s showroom in Houston today. In addition to our landscape lights, we also carry an impressive selection of bathroom lights, wall lights, sconces, pendants, chandeliers, ceiling lights, and more. Schedule an appointment with one of our lighting experts today or browse our lighting catalog online. We look forward to working with you!